Pin comments at the top that start a conversation: For music videos, you can start a conversation by commenting on your video and pinning it to the top. Use a conversational tone and encourage your fans to engage. Include your fans in the conversation: At the end of non-music videos, ask your audience a quick question and let them know to reply in the comments. You could ask them for video ideas, what songs they want to hear next, etc. Write back: Reply to fans’ comments--even when you’re out and about, or on tour by downloading the YouTube Studio app on your mobile. See which videos get the most attention from your fans by viewing Comments in YouTube Studio. Tip: YouTube alerts subscribers who have opted in to notifications when you’ve posted something new. (And you’ll likely receive a lot of comments.) Checking and replying to comments a few hours after you’ve posted a new video can boost fan engagement. Share fan-uploaded content: Show appreciation for other Artists and fans who cover or remix your music by sharing it out on your channel if you can. If someone besides you manages your sound recordings, consider working together with them to ensure fan uploaded content is not blocked--and try to feature it! Go live: Fans love seeing the real, unscripted you and it’s easier than ever to go Live with YouTube. You can even broadcast from your mobile. Connect with your fans using comments--you can reply, pin your favorite comment at the top of each video, and even ‘like’ or ‘heart’ them. If possible, feature cover videos and remixes created by fans on your channel. In the Comments section, you can pin a post that you’ve written or a favorite post from your fans. And ‘heart’, ‘like’ (thumbs up) or ‘dislike’ (thumbs down) posts. 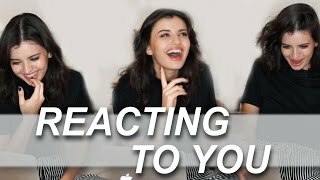 Rebecca Black called on her audience to make covers/remixes of her songs and then made this "reaction video" after she got the submissions. Channel managers can reply to your comments and help you out with other key tasks across your channel. Comment moderators have more limited permissions and can monitor and remove inappropriate comments. Some Artists have asked their die-hard fans to take on this role. You can block certain words from appearing in the Comments by adding them to a block list. All comments that contain these words will be held for review and approval. Additionally, you can easily remove, hold, report, or hide all comments from a specific user on your channel with the click of a button. Set up a channel manager who can help you reply to comments and line up channel moderators who can help review, flag, and remove spammy or inappropriate comments. You can block certain words on your channel. YouTube is a worldwide platform that can help your music reach new listeners. Here are a few tips to maximize your music’s exposure and audience growth on YouTube. Keep your video titles, channel description, and other metadata up to date—both on and off YouTube. This helps your music surface more accurately in Search results and can help your videos show up as recommended. Promote with playlists. When sharing your music on social media, link to a specific song using the link in a playlist, rather than the individual video. Collaborate! Put your music in front of new fans by teaming up with other Artists or YouTube creators. Consider reaching out to Artists who have similar demographics as you. Once you’ve got a new track or video, cross-promote between channels by inserting Cards, adding links in the video descriptions, and putting the collab on both channels’ popular playlists. You can monetize collaboration videos but you’ll have to work out the details with whomever you’re collaborating with. Consider agreeing on a set amount to split ahead of time with your collaboration partner. Learn more about collaboration, revenue, and Content ID. Format metadata properly so your videos are easy to find. Linking to playlists can promote your music on social media. Collaborations are a great way to get your music out there to new audiences. 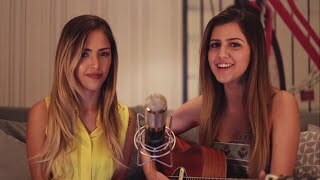 Sofia Oliveira and Gabi Luthai worked together to make a parody of a very popular Brazilian song. Community posts give you a simple way to engage with your viewers and express yourself beyond video. Note: This feature isn’t available to all channels at this time. If your Community tab is enabled, it will appear on your channel when you’re signed in. Here are some tips to strengthen your relationship with your fans through Community posts. Invite viewers backstage. Try offering loyal fans a backstage pass by doing things like posting quick videos, playlists, or photos from your tour. Viewers can see your posts in the Subscriptions feed on their phones. They can also opt in for notifications anytime you post. Share exclusive content. Try posting notes from the recording studio or giving your community a sneak peek at your rough music video. You can gauge the initial reaction of your audience before fine-tuning content to release on your channel. Take a vote. While poll cards let you embed polls in videos, you can also launch a poll directly in a Community post. Your poll topics may be serious or fun, such as having fans help you pick an outfit for your next red carpet event. Shine a light on someone. Community is another way to recognize fans who’ve impressed or inspired you. You can heart comments from viewers, or reply to them with images and GIFs. Let fans know how you appreciate them! For more ideas on using Community posts, check out this lesson. Try complementing your regular video upload schedule with a variety of community posts. Try cross-promoting other Artists with whom you’ve collaborated. Get input from fans on the creative process; It might help you push past boundaries. Post playlists of your own music—or music from other Artists that you enjoy—to share with your fans. Brazilian singer Anitta shares her latest collabs with her community, including this dance track featuring Alesso. Singer-songwriter Maejor posts pics from the road, staying connected with his community in between video uploads.